TEPSA’s Managed Security Stack comprises of 3 best of breed cloud solutions, enabling our partners to provide their customers enterprise level protection at entry level pricing. In excess of 90% of current threats enter the organization through email. It is imperative that, at a minimum, basic email firewalling (anti-spam/anti-malware) must be in place for protection, although advanced techniques such as ATP (Advanced Treat Protection) should also be utilized to prevent the latest forms of ransomware and zero-day attacks. 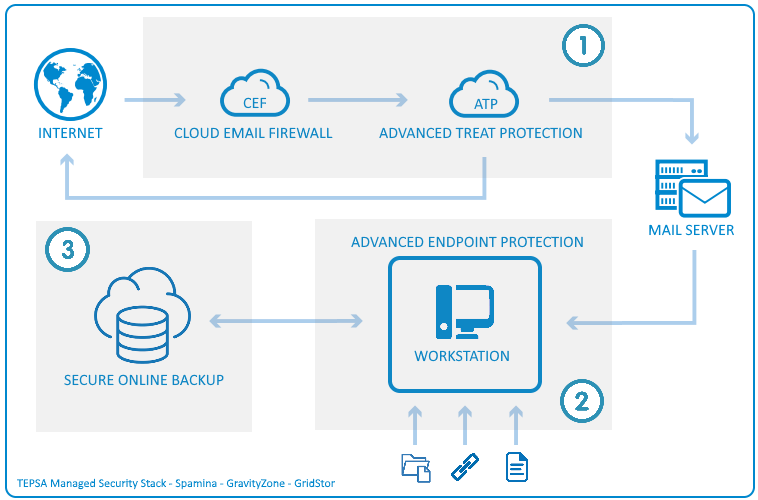 Endpoint Protection needs to be in place (commonly known as Anti-virus) to prevent local attacks or malware that may get through the email security layer. The Endpoint protection must be advanced enough to also allow WEB, Data, Application, Device and behavioral controls as they are all possible penetration points. Also known as a “safety net”, secure offsite backups should be in place as a last resort if data does get encrypted or damaged. In addition, this layer provides recovery of data damaged or lost due to human error. TEPSA’s Management Stack is provided by Avast Business's Remote Monitoring and Management (RMM) solution, Managed Workplace. 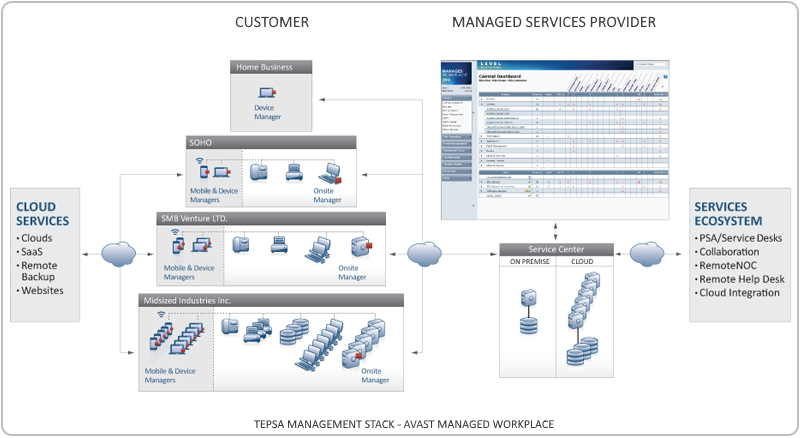 Managed Workplace is an advanced RMM platform hosted and supported by TEPSA in South Africa. TEPSA is a Tier 1 Managed Services Provider, hosting and representing best of breed international cloud managed service providers in South Africa. TEPSA’s solutions are backed by our vendor certified training and support engineers.